与 Maven 和 NAnt 集成,保证了对可执行需求的完全支持. GreenPepper is an Agile Requirements Definition and Management (RDM) tool. In addition to a conventional RDM, it also allows to verify that the system accurately satisfies the requirements. We can picture it as an Agile RDM with embedded test cases. GreenPepper simply helps you build the right software. Specifically designed to support Agile software development, it is the tool of choice for enterprises that require adaptive development processes. It is also important to note that the product is non-intrusive and is to be integrated seamlessly into your current development environment.Adaptability can also be appreciated from the software product life cycle.GreenPepper provides a permanent safety net that ensures the continuous compliance of requirements during all phases of the cycle. GreenPepper uses the tremendous power of enterprise wikis. 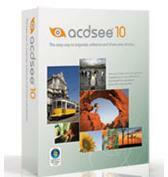 We really think it is a strategic decision to use these kinds of tools to create and manage software specifications. It is also the best way we have found to support the sharing of knowledge between business experts and software developers on an Agile team. Of course, without being a substitute but a support to face-to-face interviews and design sessions. GreenPepper allows business experts to express requirements within an enterprise wiki using a very simple and natural business language, as they would do in a conventional process. GreenPepper also provides an unmatched environment to discover accurate requirements and implement them using executable business examples. We sincerely think that by doing so you will close the gap to accurate software development. 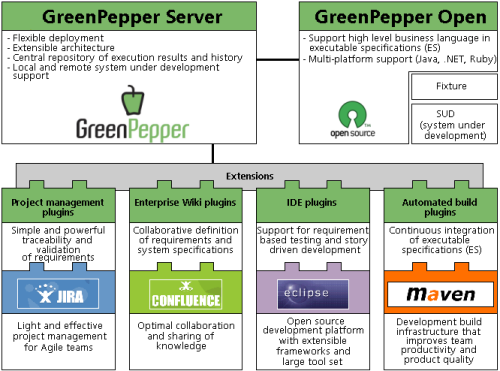 The GreenPepper Confluence plugins provide a set of tools that integrate GreenPepper with an Enterprise wiki platform. Built on top of the award-winning Atlassian Confluence, they create an ideal platform to support the collaboration creation of specification, acceptance and story tests. The GreenPepper JIRA plugins focus is to maximize traceability of requirements within your development process. To do so, issues are directly linked to specification documents and then it is possible to execute them directly from JIRA. Therefore, it is possible for you to know, at all times, which story or use case is completed, functional and really working as expected. From a project management point of view, they allow you to implement the Agile principle of working software as the only measure of progression.